Located wholly within the District of Columbia, Interstate 695 connects I-395 at the Center Leg and Southwest Freeways with the Anacostia Freeway (I-295 / D.C. 295) across the 11th Street Bridge. Following the Southeast Freeway, I-695 links central Washington with the Navy Yard district, Southeast Washington and Joint Base Anacostia-Bolling. 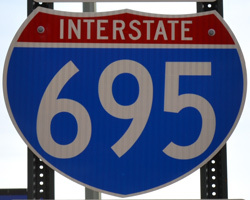 Signs installed by November 2011 during the 11th Street Bridge project revealed the signed status of Interstate 695. The Interstate was previously an unsigned route. Interstates 295 and 695 were approved in 1958 as original Interstate highways in Washington, D.C. I-695 was approved along both the Southwest Freeway, from I-66 to I-95 west of the National Mall, and the Southeast Freeway from the Center Leg Freeway (I-95) to Interstate 295. I-295 was assigned to the Anacostia Freeway and the 11th Street Bridge north to I-695 along the Southeast Freeway. Interstate 66 (Potomac River Freeway and North Leg Freeway) was planned for an extension from U.S. 29 (Whitehurst Freeway) east to I-95, with connections to the U.S. 50 freeway en route to Annapolis. Interstate 95 was originally planned to run through the district, via I-395 (Southwest Freeway / Center Leg Freeway) to U.S. 50, then north along a new alignment to the existing northern I-95 interchange with the Capital Beltway. Continuation of the Center Leg Freeway north to meet I-66 (North Leg Freeway) and the Capital Beltway was never constructed. Some of the former freeway right of way coincided with a power transmission corridor. Interstate 266 – an urban loop connecting I-66 across the Three Sisters Bridge over the Potomac River. I-266 was proposed in 1964 and was dead by 1977 due to community opposition. Due to the elimination of various freeway proposals throughout Washington, D.C., Interstate 295 was eventually shortened to end at I-695 (Southeast Freeway) on the north side of the Anacostia River. The anti-freeway revolt in the 1960s and 1970s also resulted in the cancellation of I-95 north from the Center Leg Freeway to Langley Park, Maryland and I-695 along the Southwest Freeway to I-66 (Potomac River Freeway). A portion of the East Leg Freeway (I-295) was resurrected in a 1982 plan for the Barney Circle Freeway. The Barney Circle Freeway, which formed an arc east from the Southeast Freeway to D.C. 295 along the Kenilworth Avenue Freeway, was listed in the Federal Highway Administration Interstate Route Log and Finder’s List as part of I-295. Removed from consideration in 1996, planning documents previously referenced the freeway as Interstate 695. Planners developed a new plan in 20075 to reconstruct the Southeast Freeway (formerly I-295) with replacement bridges over the Anacostia River and provide full movements at the interchange with the Anacostia Freeway (I-295 / D.C. 295). The purpose of this request is to redesignate the 0.61 mile portion of I-295 crossing the Anacostia River to I-695 to maintain system continuity. I-695 (Southeast Freeway) begins where I-395 turns north into the 3rd Street tunnel in Southwest Washington, and continues for 1.39 miles to the interchange with I-295 at 11th Street in Southeast Washington. In 1984, the District received approval from AASHTO to redesignate I-695 to I-395, and to redesignate the portion of I-395 through the 3rd Street tunnel as I-195. However, this approval was contingent on extending I-695 across the Anacostia River and connecting to DC 295 north of Pennsylvania Avenue. Since this connection was never completed, I-695 was never redesignated. This original application will be abandoned with approval of the current request. 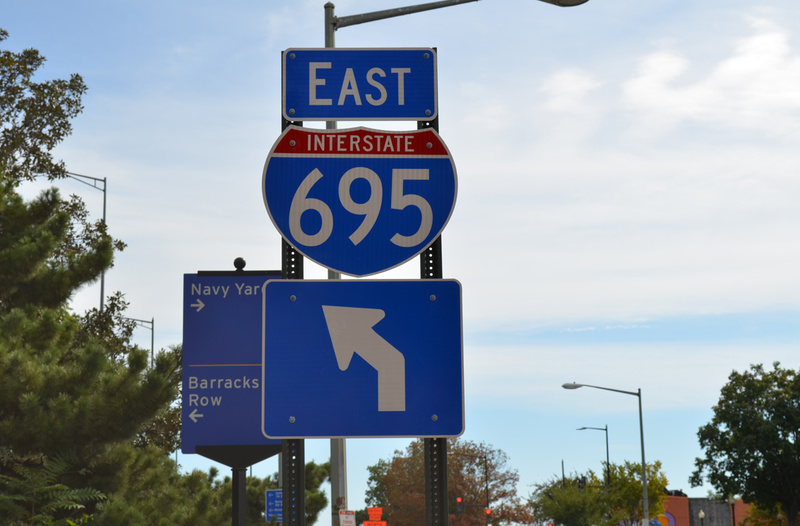 With the pending de-designation of a portion of I-295, I-695 will no longer connect to an interstate highway at its eastern terminus. Because of this, the District is requesting to extend I-695 across the Anacostia River on the de-designated I-295 alignment to a new terminus at the end of I-295. This change will serve to rationalize the freeway system in the District and provide for interstate connections at both ends of I-695. East End Anacostia Freeway – Washington, D.C. Traveling south across the 11th Street Bridge, Interstate 695 splits into two lane ramps for D.C. 295 north to U.S. 50 and Interstate 295 south to Oxon Hill, Maryland. Photo taken 12/16/16. Historically the 11th Street Bridge defaulted onto I-295 south with no access to the Anacostia Freeway north. Photo taken 10/12/14. An end sign for Interstate 695 precedes the merge with the D.C. 295 south flyover to I-295 south. Photo taken 10/12/14. More photos from the 11th Street Bridge south at the Interstate 695 D.C. guide and the Archive page for I-695. Exit 5A departs from the left side of Interstate 295 north for I-695 west across the 11th Street Bridge. Exit 5C leaves simultaneously from the outside lane for Martin Luther King, Jr. Avenue south and 11th Street SE north. Photo taken 12/16/16. I-295 north transitions to D.C. 295 north as the Anacostia Freeway continues to East Capitol Street. Prior to 2009-13 construction, the ramp for the 11th Street Bridge (then hidden I-295 north) exited from the right side here. Photo taken 10/12/14. More photos from this perspective found at the North Interstate 295 D.C. guide and the Archive page for I-295. Providing access to the 11th Street Bridge north from D.C. 295 south, the interchange at I-295/695 was completed in 2012. D.C. 295 transitions into I-295 south along the remainder of the Anacostia Freeway. Photo taken 10/12/14. More photos from this perspective found at the South Interstate 295 D.C. guide and the I-295 D.C. archive page. West End Center Leg Frwy – Washington, D.C.
Interstate 695 (Southeast Freeway) defaults onto I-395 (Southwest Freeway) south toward Arlington, Virginia while a single lane ramp drops from the four lane viaduct into the Mall Tunnel. An end sign was added at the transition from I-695 west to I-395 south by August 2014. Photo taken 10/12/14. More photos from this perspective found at the Interstate 695 D.C. highway guide and the I-695 D.C. archive page. The sign for 6th Street S.W. was removed for the continuation of I-695 west onto Interstate 395 south. I-395 south passes south of the National Mall en route to the George Mason Bridge into Virginia. I-395 north travels north under the U.S. Capitol complex, passing through a tunnel that emerges north of D Street. The freeway ends at U.S. 50 (New York Avenue). Photo taken by Steve Hanudel (08/12/05). Interstate 395 (Southwest Freeway) travels below grade from L’Enfant Plaza to a viaduct spanning 4th Street SW leading to Exit 5 with I-695 (Southeast Freeway) east. Photo taken 12/16/16. Interstate 395 curves northward onto the Center Leg Freeway as I-695 east takes over the freeway mainline toward Washington Navy Yard and the 11th Street Bridge across the Anacostia River. Photo taken 12/16/16. Exits along Interstate 395 in the District of Columbia were renumbered. Left Exit 2A for I-695 became Exit 5 and the C Street off-ramp changed from Exit 2B to 6. Photo taken 10/12/14. More photos from this perspective found at the North Interstate 395 D.C. highway guide and the I-395 D.C. archive page. Interstate 395 enters the Mall Tunnel beyond D Street ahead of the left exit for I-695 (Southeast Freeway) east. Photo taken 01/04/19. Interstate 395 emerges from the Mall Tunnel at the three-wye interchange with the Southwest and Southeast Freeways. Exit 7 leads to both I-695 east for the Anacostia Freeway (D.C. 295 north / I-295 south) and South Capitol Street to the Navy Yard district and Nationals Park. Photo taken 01/04/19. More photos from on the South Interstate 395 D.C. south guide and the I-395 D.C. archive page. “Virginia Avenue Tunnel project advances in D.C. amid neighborhood disruption.” The Washington Post (DC), January 28, 2017. “Clark/Parsons Reaches Substantial on Virginia Avenue Tunnel Reconstruction Project.” Clark Construction Group, news release. January 14, 2019. 11th Street Bridge Project. http://ddot.dc.gov/page/11th-steet-bridge-project District Department of Transportation (DDOT), web site. Page updated February 21, 2019.